It is wonderful to have access to fresh herbs year-round to help add flavor to your cooking. An easy and convenient way to make sure you always have your favorite herbs on hand is to get yourself a hydroponic herb garden kit. These at-home devices give you fresh, tasty, pesticide-free herbs all year round. They are incredibly easy to get started, and they don’t take up much space in your kitchen. If you are just getting into hydroponics, you may have found some of the terminologies are a bit confusing and are wondering about how to choose the best system for your needs. After analyzing expert and user reviews, we have found the four best Hydroponic devices that are currently on the market. We will take you through the features of our top-rated models and what you need to know before purchasing any of these indoor herb gardens. PROS: The Miracle-Gro AeroGarden is the best choice if you are looking for an indoor hydroponics device. It has excellent consumer reviews, some different sizes, and features to choose from. Atheistically it looks great on a kitchen counter. It is incredibly easy to use; the display tells you exactly what you need to do and when. Guaranteed to grow” if yours doesn’t they send you a free replacement with free shipping. Cons: The refill seed kits and other accessories can get a little pricey. 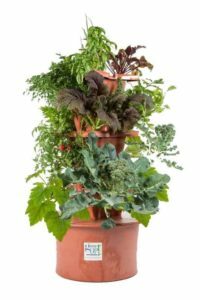 Overview: The Miracle-Gro Aerogardens are hands down the leader in the indoor hydroponic systems, they are best sellers, very highly rated and users love them. They look fantastic, provide exceptional results and come in at three (very affordable) price-points to meet your needs. It even grows plants five times faster than soil. You can also use it to produce many different things including fresh herbs, vegetables, salad greens, flowers, etc. There are a couple of different sizes you can get: the 3 SL, 3, 6, 7, the Extra and the Ultra. Any of these models are a great option. The main difference between the various models is the number of pods each has as well as some of the functions on the display panel. 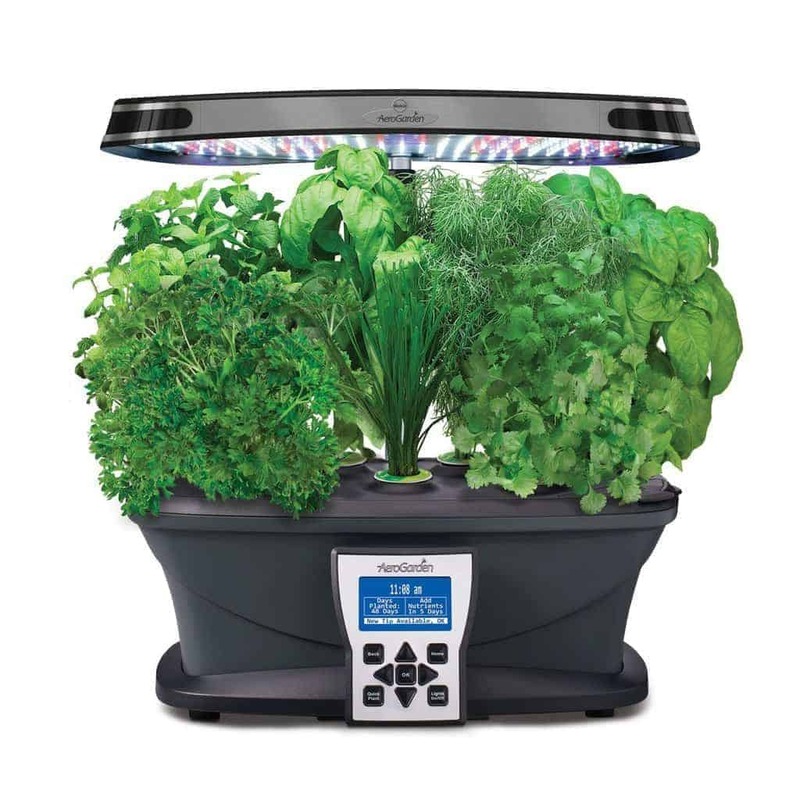 Depending on the system you choose they come with various items including growing lights, self-watering devices, and over 40 different seed pod kits ranging from chili peppers to salads. The systems can be put together very quickly, meaning that even if this is your first time growing, you won’t face any setup headaches. All the parts are manufactured so that it’s as easy as just clipping the pieces together. Users find the Aerogardens extremely easy to use, all you have to do is add water and mix in some nutrients, and you are all set to go. The performance of the plants is also extraordinary; things grow quickly and effortlessly, and if you do happen to get a pod that doesn’t produce anything it will be replaced free of charge. Reviews have also noted the excellent customer service that Miracle-Gro provides. If you have any questions or get stuck, they will happily help solve your issues. PROS: Looks great, and it is a fun introduction to aquaponics. Once you get the aquaculture and the hydroponics in sync, you will have a fish tank that requires little to no cleaning, that is producing fresh herbs for you to use. 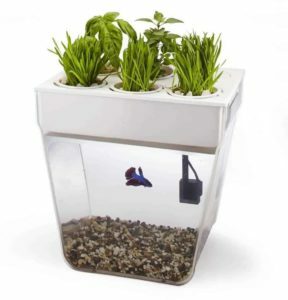 CONS: You have to deal with trying to reach a “self-cleaning” state of the tank by getting the nitrogen cycle and the plant growth working together, this may be a little easier said than done for some users. Some customers have trouble keeping the plants growing if they don’t have enough light. It doesn’t come with a heater for the tank (you have to purchase that yourself). You will need to learn about your fish and fish care if this is new to you, as well as nitrogen cycling and the theory behind aquaponics. 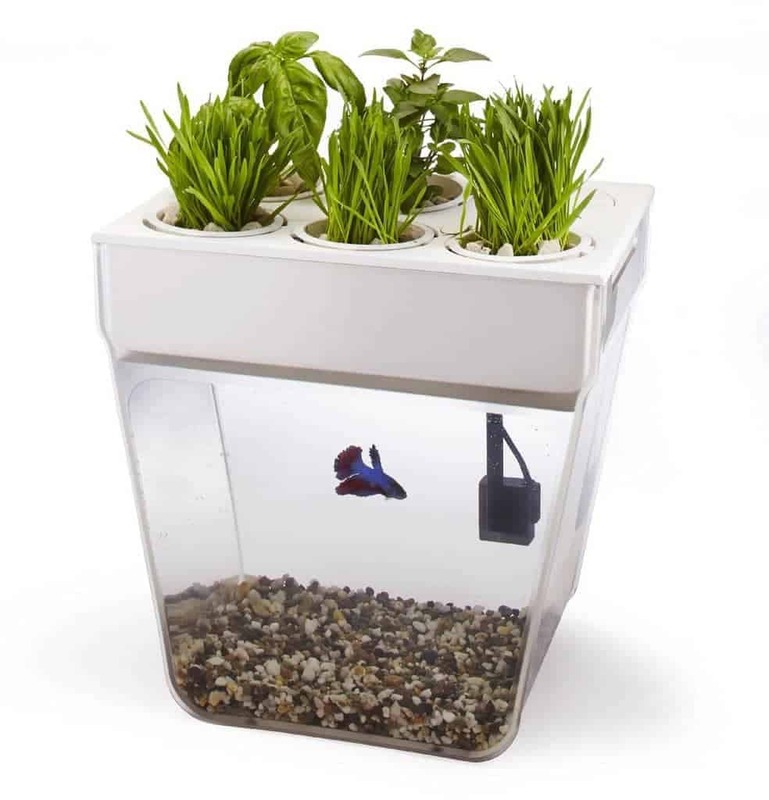 Bottom Line: This isn’t a hydroponics garden but an aquaponics product, but it is pretty cool, so we included it anyway. Aquaponics just kind of means that you are adding fish into a type of hydroponics system. The fish waste provides an organic food source for the growing plants, and the plants produce a natural filter for the water the fish live in. This particular system comes with: wheatgrass, basil alfalfa, radish sprouts, parsley, cilantro, mint, and arugula. If you end up purchasing the Back to the Roots, you will need to spend a bit of time reading the directions for use and making sure you understand each component of the system. Many users seem to find this product a little difficult to get everything right and working correctly. What reviewers love: It is a fun system for kids to learn. It is easy to install. Users like the concept of this product and are fascinated by how it works together. Once it is up and running correctly, there is little to no cleaning, which is a definite plus for most people. What could be improved: A few reviewers have had some trouble with the pump. Others have mentioned that they would have liked to have a heater for the fish included in the kit. PROS: Easy to assemble and easy to use. The pots are made of thick, durable plastic and the assembly very easy. Since it is vertical, you get more growing room. CONS: Doesn’t come with enough perlite to fill all growing spaces. It also doesn’t come with any seeds or plants. What reviewers love: Users love that the system is much cleaner and easier to use that growing with dirt and that it lets you develop a wide variety of organic, local produce with minimal effort. Users have also found the companies support and customer service to be very helpful in solving problems that customers have run into. What could be improved: Many users have found that the kit does not provide enough perlite to fill all five levels. PROS: Straightforward setup: put the pots in the device, add water, and plugin. The simple ultra- modern design will fit nicely into most kitchens. CONS: Some users find the refill cartridges to be pricey. There are a few complaints that one or more out of the three pods didn’t end up growing and had to be replaced. Overview: Using the Click and Grow Smart is easy. You can have it set up in just a few simple steps. Each set comes with three herbs. All you have to do is install the cartridges in the dome and add water to the tank. Once it’s all set up, you plug in the LED light. Then you can just let it go. The bulbs and water do all the work for you. If the water needs to be replenished, the light starts blinking, so you don’t even need to worry about monitoring that. This kit comes with Thyme, Basil, and Lemon Balm which is an excellent starter selection. They also offer Chilli Pepper, Salad Rocket, and Mini Tomato for your consideration in replacement cartridges. Setup instructions are clear and straightforward – including advice on positioning for adequate light and overall best practice options for a thriving garden. 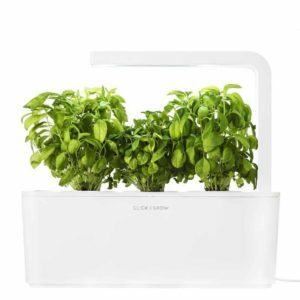 This system makes it easy and fun to grow your herbs. What reviewers love: Reviewers love the beautiful design of the Click and Grow, it is easy to use, and the plants last for a long time. What could be improved: Some users have found pots are not growing, although this is to fix as Click & Grow will ship you a new cartridge if this happens. Will you eventually want to produce items other than herbs (flowers, lettuce, etc.)? Having an indoor garden is fantastic, but you may find that you want to try and grow other things that may require more room or a larger capacity product. If you know that you only want to grow herbs, you will want to look at some of the smaller products like the AeroGarden 3 or the Click & Grow that caters to just growing herbs. If you think there is some chance you will want to grow flowers or vegetables at some point, you should consider the AeroGarden Ultra. The average life of plants grown in these types of kits is around four months. They may last quite a bit longer or not grow well at all. Some of the companies guarantee the seed pods that come with the gardens so if they don’t produce anything you may be able to have them replaced for free. Does the kit come with everything that you need? There is nothing worse than getting a kit and realizing that you have to go and buy more things to start using the equipment. The cool thing about these sets is that they generally include everything that you will need to get growing including the seeds, instructional booklet, and a bottle of nutrients. The Grow Up! doesn’t come with seeds or plants, you supply those yourself. Will it add much to your electricity bill? The cost of using an indoor hydroponic device is going to vary quite a bit from system to system, but here is a breakdown that Aero Garden has on their website that gives an idea on how much energy you will be using. Each system has a slightly different requirement for keeping it clean, but overall the point of these products is that they shouldn’t be a huge burden to keep going. Although it is essential to read the directions and follow cleaning instructions, as it will help reduce the risk of root pathogens that can destroy your crop. Will there be much upkeep? Again these devices are meant to be easy to maintain so you can expect to have to do a minimal amount of cleaning as well as having to add water and nutrients every few weeks (the unit should have a light or a message to remind you ). You will also have to ensure that you are trimming the roots about every four weeks, and cutting back the plant when needed. Will the unit be loud when it is running? There will be some noise, as most units generally have a water pump to circulate the water, although the noise is very quiet often described as a low hum, or you may hear a dripping water sound. The sound is generally not a big issue with these devices. If you are thinking about getting a deluxe model that you may be hoping to put on a kitchen counter, be aware of the size of the garden. You will want to ensure that it fits comfortably in your living space. Where do you buy replacement seeds or pods? If you purchase a system that required replacement pods, they are available on the manufacturer website, or you can buy them through Amazon. What types of herbs thrive in these kits? Some of the most popular culinary herbs for hydroponic production include: basil (sweet basil, lettuce leaf basil, globe basil, Thai lemon basil, cinnamon basil, Siam Queen Basil, and purple/opal basils), rosemary, mint, lemon verbena, French tarragon, Italian flat-leafed parsley, baby dill, sage, oregano, thyme and cilantro. What materials are these self-contained gardens made out of? Since you are growing food, the type of material that the device is using will be significant to some consumers, primarily if you are investing in one of these systems as a means to eat healthily and reduce pesticide intake in your diet. Look for products that are made with food-grade plastic (Miracle-Gro Aerograden, Grow Up!). Do these types of products come with a light? Some of these kits come with a LED light included, while others do not. If you get a system with an LED, you will have the light on for most of the day. If you get a system with no LED, you may have to think about a grow light for the winter when there isn’t as much natural light. There are a lot of great grow lights on the market you may need to research what type of light will work best for your climate. How long will the LED light last? If you purchase a system that uses LED you can expect to get about 3-5 years out of the lights. Some of the systems run for 17 hours per day. LED bulbs can range in lifespan estimates depending on the manufacturer. A primary consideration when choosing your system will be the cost. Many people will want to weight the value of the device with how useful it will be, how much they already spend on herbs and whether it is worth investing in this type of product since the initial cost can be quite high. If you’ve always wanted to grow herbs indoors but didn’t think you had the knowledge or the time, one of these self- contained, ultra-fun hydroponics gardens could be just what you need. You will be able to easily and quickly grow all the herbs you could ever want or need, all in the convenience of your own home.